The specificity of the title of Agnès Varda’s canonical film, Cléo de 5 à 7, is both playful and misleading. It is playful because in spite of its exactitude, it is incorrect, though understandably so, as the poetry would be lost if Varda had opted for the more factual Cléo de 5 à 6:30. It is also misleading because it enforces the assumption that this film is simply about a woman named Cléo and more specifically, about two hours in a single day in her life. The universal truths of the story can be lost on the audience. The film in its entirety is a triumph of exploring those universal truths through precise, intimate specificity. When we first meet Cléo, a fortuneteller is reading her cards. This is the film’s only color sequence. How paradoxical, really, that the only scene with a total absence of vibrant camera movement is the one that features the vivid reds and greens. When Cléo, a narcissistic, young chanteuse, receives the wisdom that she might not have much time left above ground, her world turns grey as the film turns black and white. She begins the nervous process of waiting to hear the results of a medical test that can confirm her terminal cancer, though she might as well be assured that her days are numbered. Cléo walks on the streets of Paris, chats with her maid in a cafe and at a clothing store, tries a song or two with her songwriters at her apartment, shortly after her lover stops by for a quick hello, and finishes her wait with a soldier she happens to meet before he goes off in uniform. The real time progression of these ninety minutes in her life comprise the entirety of the film. Varda’s stylistic approach is varied and unique. Her photo-journalistic treatment of the urban landscape of Paris gives the film a cinéma vérité quality that affords it with a calculated but airy sense of visual fluidity. It also reinforces the idea that the reality of Cléo’s existence is one which is so tangible we can almost, for some fleeting moments, inhabit it. Yet, this tactile, free-wheeling aesthetic is technically controlled and thematically rich. Compare the movement in the sequences on the street with the swinging camera that is attuned to Cléo’s singing in the practice scene in her apartment, or the amusing recreation of a silent film starring Anna Karina and Jean-Luc Godard. Over the course of its one and a half hours, the film oscillates between rhythmic, painterly brushes and rugged documentary realism. In Cléo de 5 à 7, Varda’s most noticeable stylistic decision is the way she sculpts time. As audiences, we are usually accustomed to elliptical editing, our brain is unconsciously rearranging the duration of each scene. Varda reminds the audience consistently of the real time progression of the film by clearly demarcating its temporal space into different segments. This has two effects: the first is to adjust and readjust the audience’s expectations (Cléo’s maid appears to be very loquacious in an early diner scene because a similar cutting routine in a different film would suggest a longer passage of time; then we are told of how long she has actually been talking through the onscreen announcements that divide the film throughout; but by continuing the scene, we are again alerted to how long a five minute conversation with a stranger in a diner really is). The second effect is to emphasize Cléo’s nervousness and restlessness as she awaits her test results. The film conveys the difficulty of having to await a medical result as important as the one in Cléo’s case by literally counting down the minutes, and creating a psychological effect that drags every second to feel so much longer than it is. From a storytelling point of view, and because of the themes the film explores, Varda’s perspective is refreshingly, even for today’s standards, feminine. Cléo is not just a film made by a woman about women, but it is significant for the way it subverts our narrative expectations. This is important because the character she chooses to portray isn’t simply sympathetic for the sake of creating an unbalanced ‘men versus women’ image. We are used to seeing the likes of Cléo differently in a vast majority of films (she would be reduced to a supporting character, and an irritatingly nagging and narcissistic one at that) but she gives her so much depth and many psychological shades. Varda’s feminine voice isn’t only mirrored internally through her character, but also externally through the spaces they inhabit. The most prominent example is the juxtaposition of Cléo as she roams the streets of Paris with street performers. Cléo’s experience of being gazed at, catcalled and harassed continually on the street is set against two grotesque performers – one a man who eats live frogs and another who pierces his own bicep with a long metal rod – around whom people gather, watch intently and scream. Varda doesn’t explicitly criticize the misfortune of having to live with such mistreatment on a daily basis, but the sense of unavoidable discomfort is conveyed to the audience with precision. 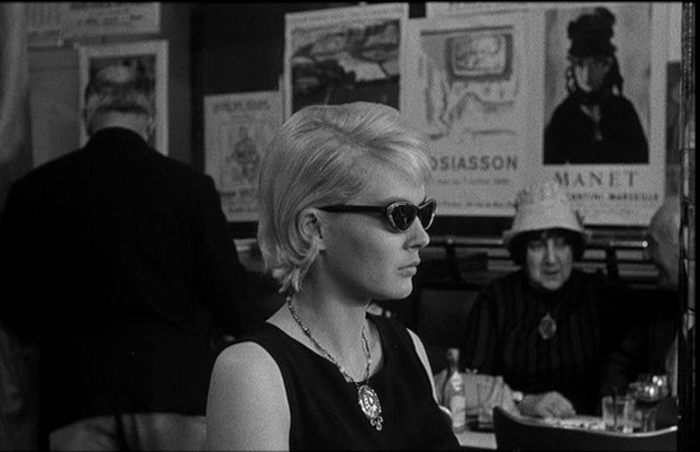 This is one example among many in Cléo; the richness of Varda’s screenplay exceeds far beyond the limitations of a review of this length – think, for example, about the casual way in which Varda incorporates otherwise throwaway lines about Cléo’s problems with her illness through different perspectives to highlight the different and prevalent perceptions of women in cinema. Despite its stylistic experimentation and its thematically challenging nature – Cléo does, after all, belong to the rive gauche movement, the more radical sister of the French New Wave – its lasting legacy also owes much to its emotional resonance. Cléo’s singing sequence, a passionate ode to love and the beauty of life, or the sexual energy of her interaction with the soldier on a streetcar as they ponder a kiss that never arrives, are but two examples of the raw, visceral impact of the film. There is another important factor contributing to this relatable emotional experience: Varda surprises her audience by preventing Cléo from getting to the end as she closes the film before 7. As we ponder what the next few minutes might have in store for Cléo, we find the key to the film’s universality. Varda has invited us not just to understand the protagonist, but to become her. Beautifully written. You really made Cléo come alive and I had zero desire to watch any French New Wave film. Cheers.